TaylorMade's Burner series has been a tried-and-true set of golf clubs over the years, and this year's is no exception. Its sleek design and large clubhead allow it to boast the highest MOI in golf. They also promote several features included in the Burner Driver that make it one of the most popular clubs on the market. MOI (short for Moment of Inertia) became a golf buzzword around 2007 when Nike, Callaway, and TaylorMade began designing drivers with large club faces with weight distributed to the outside to fight twisting on off-center hits. The Burner Fairway Woods are designed specifically to boast a high MOI and a massive sweet spot. This translates to a much more forgiving golf club, for those of us who botch a tee shot or two over the course of a round. 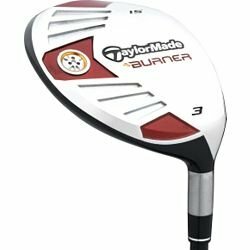 Like the TaylorMade Burner Driver, the Fairway Woods incorporate TaylorMade's SuperFast Technology, making them one of the lighter Fairway Woods on the market today. This in turn increases club face speed at impact, adding that much more distance to your bag. Included with the TaylorMade Burner Fairway Wood series are Winn grips, one of the most popular grips in golf today. This is nice at first glance; however, many golfers when making an expensive purchase like this elect to customize and add their grips of choice. While it is nice to see quality grips on a quality club, it's not entirely practical. The TaylorMade Burner Fairway Woods are designed to provide distance and forgiveness, and that's exactly what they do. The SuperFast Technology combined with the high MOI amount to a great club for both newer golfers trying to reduce their slice and more experienced golfers looking to increase their distance.